The tent comes equipped with 6 windows that provide a good view from all sides and ventilation. 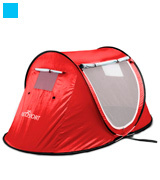 They also prevent insects from getting inside the tent. The model is a bit bulky. 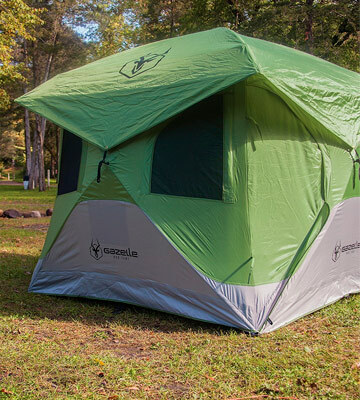 A full-sized and spacious Gazelle 33300 tent is as close to an actual house as it gets. Large enough for several people, the model doesn't take a lot of time to set up. Moreover, a well thought-out design with a bunch of convenient features make it one of the best pop up models out there. 9" x 9" x 55"
Despite the fact that the spacious model offers enough room for a couple of people, the tent is surprisingly lightweight and can be easily transported. The stakes may seem somewhat short. Abco Tech is an ideal option for those who'd prefer to get the kind of tent that can be installed in a matter of seconds. All windows can be closed at any time in case of harsh weather and, thanks to the rugged frame, the tent is capable of withstanding heavy winds. 39" x 71" x 95"
All internal stitches of the tent are faced inwards. The zipper locks are made with an addition of weather-resistant fabric that provides additional comfort during the rain. The tent has only one door. Coleman Pop-Up is a model that is extremely easy to use. 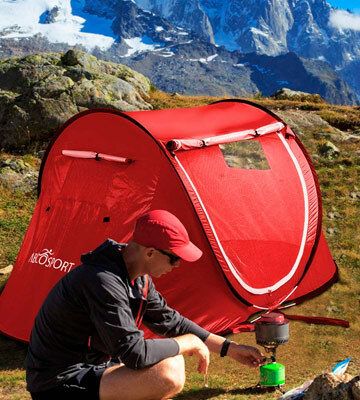 Unlike conventional tents, this one doesn't require any additional hardware to install. 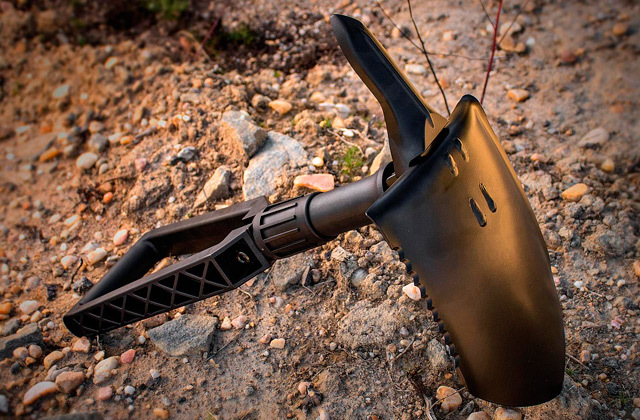 Just take it out of the carry bag, put it up, fix it in place, and you should be good to go. 40" x 110" x 78"
A 190 TPU grade fabric that has a UV protection rating of 50+ will protect you from sunlight as well as from the heavy rain. It is rather difficult to fit the tent inside the carry bag. 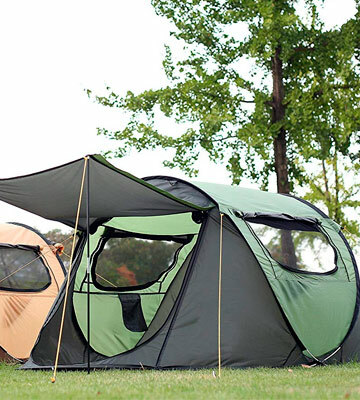 Made to impress, the tent from ZOMAKE will be suitable even for beginners. A true casual camping model that will also come in handy for fishing and other hiking activities. 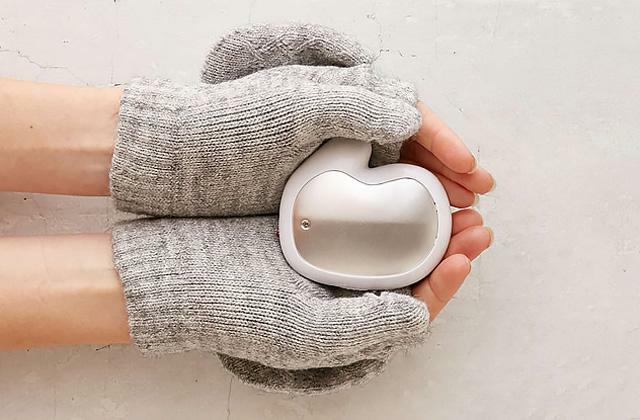 A well-thought-out ventilation system, as well as double windows, doors, and top opening, removes any moisture without breaking a proverbial sweat. 39" x 95" x 71"
A triple door design consists of rainfly, privacy, and insect nets. 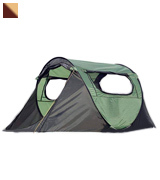 Moreover, the doors are positioned parallel to each other so it will be easy to leave the tent from either side. The carry bag is a tad thin. A quality convenient model that can be popped up with just a few simple motions. 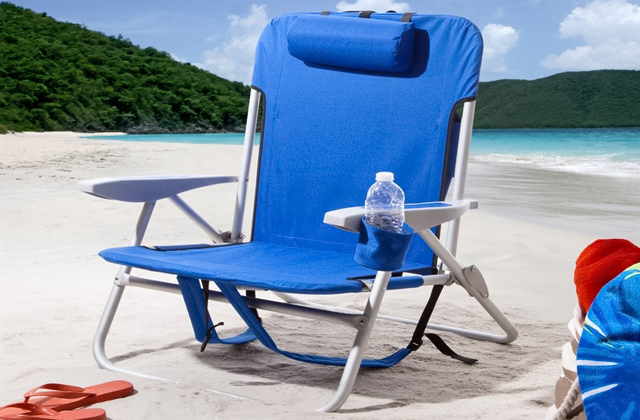 On top of that, this product comes with a full set of accessories that will make your holiday truly special. 48" x 108" x 72"
The 33300 large pop up tent from Gazelle is a simply enormous model that will prove to be more convenient than any other conventional tent. Sturdy, stable, and reliable, it can even serve as an alternative to some of the more sophisticated solutions. In addition to the model, you'll get a convenient duffel bag that is 68-inch long and can easily fit all the components of the tent beside the tent itself. 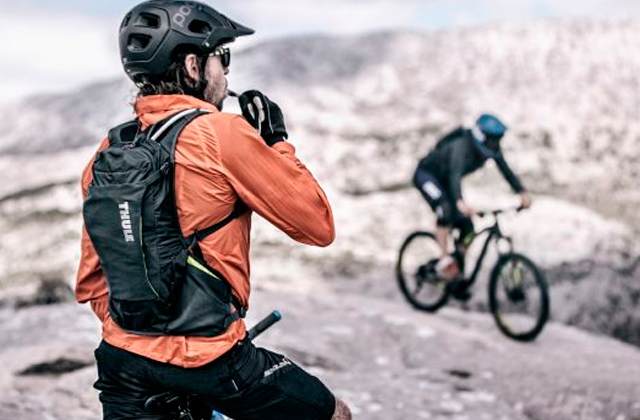 On top of that, the model comes equipped with a removable floor, rain fly, and a gear loft. As the manufacturer states, the tent can be easily assembled and set up in just 1,5 - 2 minutes and that alone makes the T4 Camping Hub an incredible piece of traveling equipment. 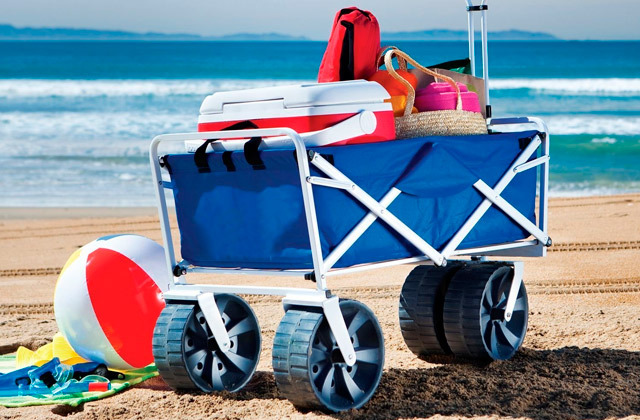 Since it requires almost no effort to set this spacious hub up, it will be a perfect addition to your beach parties. 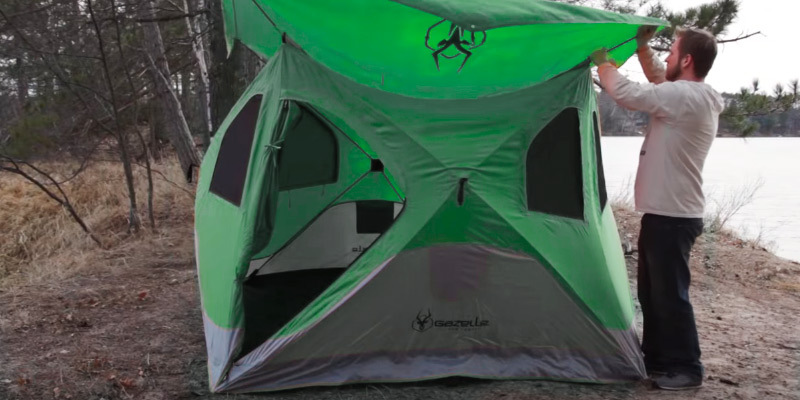 Once assembled, the floor tent becomes a 40 square feet room that can easily fit 3 adults and there will still be plenty of space to put your favorite items as well as camping backpacks and other equipment. Plus, the 4 and the 4-8 options are also available. Moreover, the top cover of the tent can provide you with additional shade inside that tent as well as with extra protection from the rain. Although this particular model may seem somewhat bulky for a 3-person tent, if you properly set your equipment inside it, the product can easily serve as a 4-person tent. So, if you're looking for a pop up tent that could almost replace an actual house, this is your pick. A great 2-person model from Abco Tech combines the advantages of light weight and simplistic convenience. The tent features two windows that are made of mesh materials, providing a breathable environment inside the tent and allowing for much better ventilation compared to regular models. 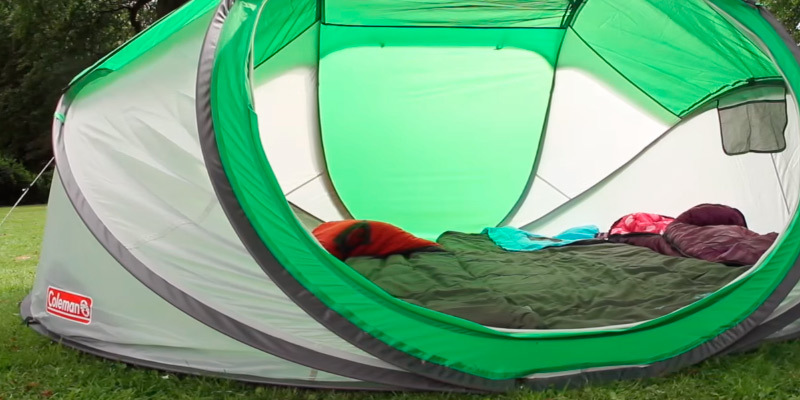 The weight of only 7 pounds makes this easy pop up tent a perfect pick for long trips. What is more, the tent comes equipped with a special carry bag that allows for easy transportation and quick installation. 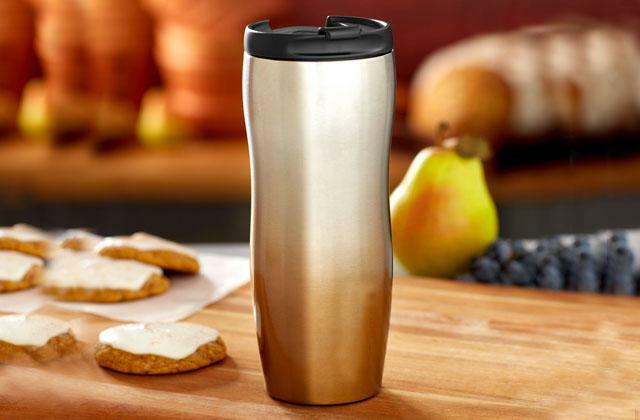 The whole thing can be put up in a matter of seconds once it has been taken out of the carry bag. 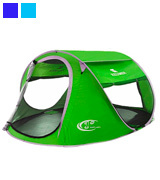 The tent can fit up to 2 grown-ups or 3 to 4 children, depending on their height. 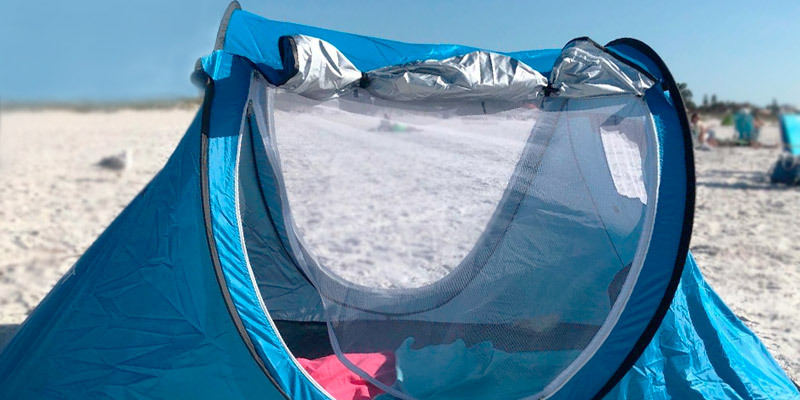 As for the materials, the tent is made of water-resistant nylon fabric that protects your skin from harmful ultraviolet rays, meaning that you won't have to worry about the sunburns. Even if you are not a professional hiker or camper, you will be able to easily set up this model. And we bet that even your kids will manage to get a grip on it after a few tries. Plus, they will absolutely love this tarp castle since it can act as an alternative to a pillow fort inside or outside your house. Besides the comfort of your home, the Abco Tech automatic pop up tent will also come in handy in harsher places, making it a great option for casual camping. 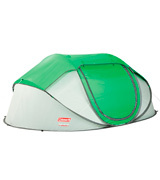 The Coleman Parent Pop-Up tent was designed specifically for rough terrains and extreme weather conditions. Thanks to the Weathertec technology, the tent is highly weather-resistant, which makes it an all-around convenient option for just about any camping occasion. What is more, the strong frame and the poles firmly protect the construction from rough winds. In addition to the rugged construction of the walls and the roof, the tent also has a waterproof floor and a zipper protection that prevents the water from getting through the zipper cuff. Unfortunately, the zipper locks become a bit stiff over time. But if you treat the tent with care, the locks shouldn't become too much of a problem in the future. Although the 40” x 110” x 78” of overall dimensions make this pop up camping tent a fairly spacious model, it will be somewhat tricky to get in and out of it since it has only one door. 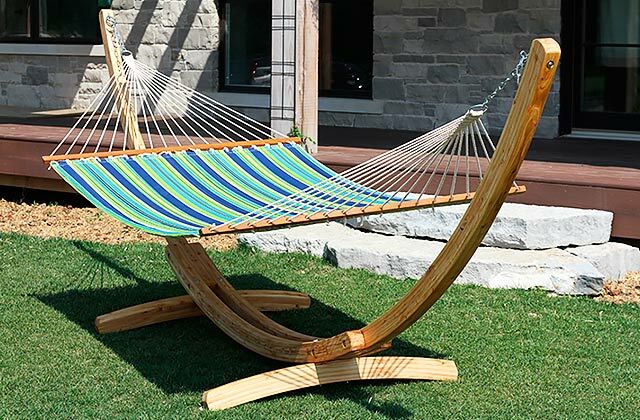 Despite that, this handy model from Coleman will easily guarantee a night of restful sleep for up to 4 adults. Of course, that's if you manage to fit all of them with their sleeping bags inside the tent. 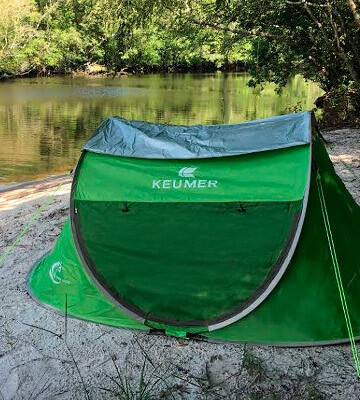 All in all, with a full set of accessories, this high-quality pop up tent with slides will be a great gift for anyone who enjoys casual camping at the beach or in the forest. 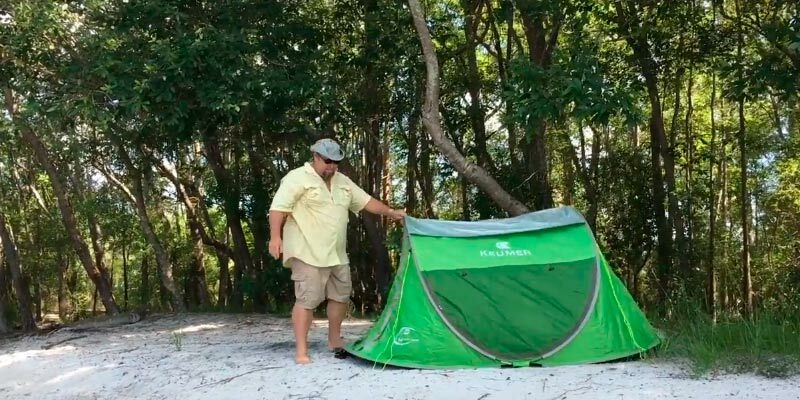 Easy to set up, the ZOMAKE beach tent will come in handy for medium-sized camper groups that tend to go hiking from time to time rather than for professional campers. Although this 4-person model comes with a carry bag, it can be rather difficult to fit the tent back in that bag once you take the tent out. The collapsed tent is 34.8” in diameter and the bag can barely fit it, so it may take more than a minute to shove it back inside. The assembled overall size of the tent stands at 39” x 95” x 71”, so it can easily fit 4 adults. On top of that, this small pop up tent has 2 doors and 2 windows that can act like smaller doors in order to fit all the campers inside. As for the means of installation, the product comes supplied with fiberglass poles and patented Hoogan hooks that make the tent stable and simplify the installation process. The whole process takes roughly 45-60 seconds since there’s no need for any additional equipment like coverts or metal poles. As for the convenient features, the tent is made of special anti-UV and water-resistant 190TPU polyester that can withstand even the strongest heat and winds. The UV coating has a rating of 50+ that lets only 2% of all solar radiation reach the fabric of the tent. Finally, the great water-resistant and sunproof properties make this model the perfect middle-ground between professional and casual tents. The instant pop up tent from Five Joy is a perfect model for single hikers or for couples that are planning a camping getaway for a weekend. 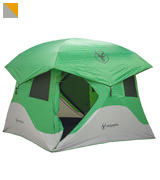 The tent includes all of the standard camping equipment like the fiberglass poles as well as a set of ropes and pegs. That means the only thing you'll have to bring with you to the camping site is the carry bag with the tent that weighs only 8 lbs. 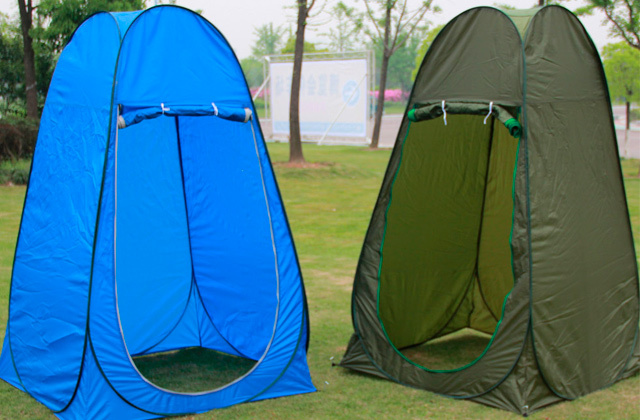 This 2 person pop up tent has 2 doors and 2 small mesh windows with insect nets that provide great ventilation. What is more, the door covers, as well as the tent tarp above them, can act as additional sources of shade. The windows can be quickly turned into rain flies by simply moving guy lines to the stakes below them. 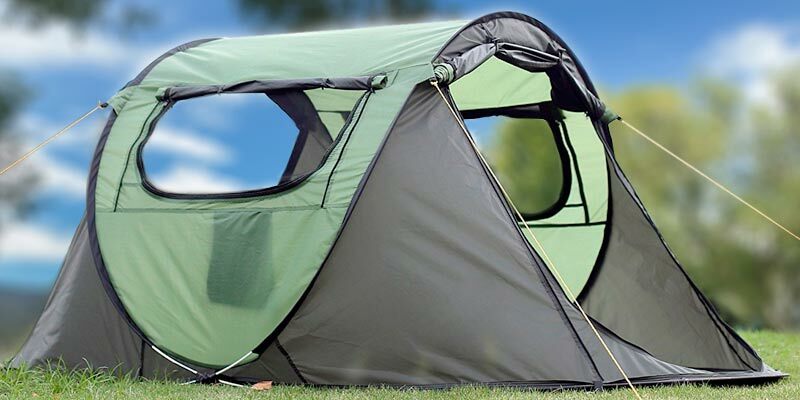 Although the material of the tent is made with the addition of the PU coating, it is not recommended to use the product during thunderstorms or particularly heavy rain. 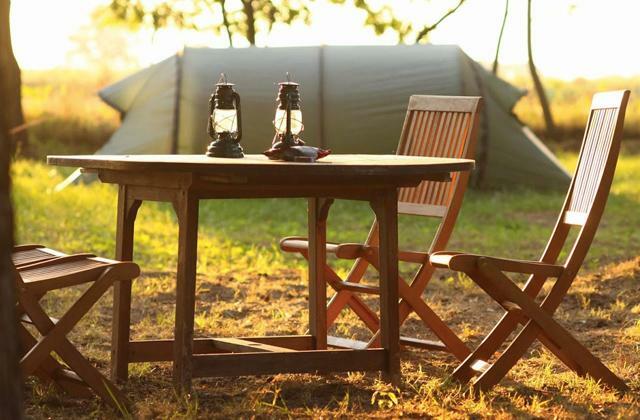 As for the comfort, there is a special loop designed for hanging an electric lamp inside the tent. Unfortunately, despite the average size of this model, it can barely fit 2 adults, so you should keep in mind the height of your companion if you intend to bring somebody with you. 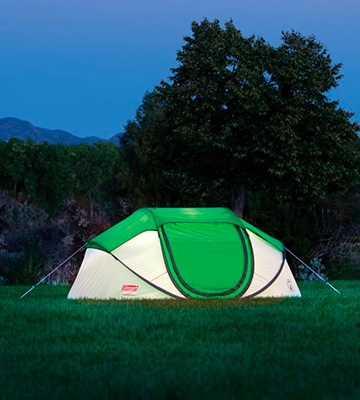 In conclusion, this FiveJoy pop up tent will prove to be a great addition to your casual camping trip. What Is a Pop Up Tent? Regular camping tents take too much of precious time to install. 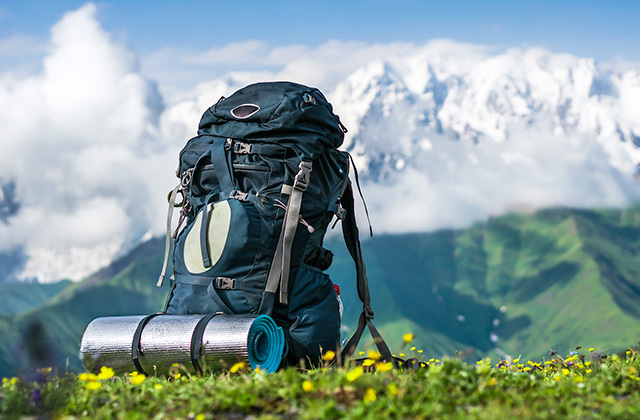 Plus, if you are an inexperienced hiker, it can be rather tricky to set them up. The pop up tents are designed to fix these issues. They take no more than a few seconds to install and do not require any particular skills whatsoever. 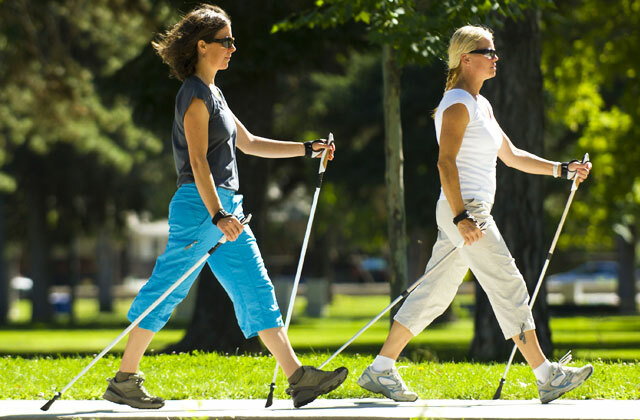 Lightweight and easy to use, they can come in different flavors. Depending on your needs, you can choose between various tent sizes. If you are planning a camping holiday with your family or friends, you should look for models that are designed for 2 or more individuals. Otherwise, a smaller model made for one person will be your best pick. Other aspects such as ultraviolet protection rating and waterproof properties are also important since they will protect you from harsh weather conditions. Some models also come with an additional set of windows or doors that make them more breathable and improve the indoor ventilation of the tent as well as its accessibility, especially if you're sharing that tent with other people. 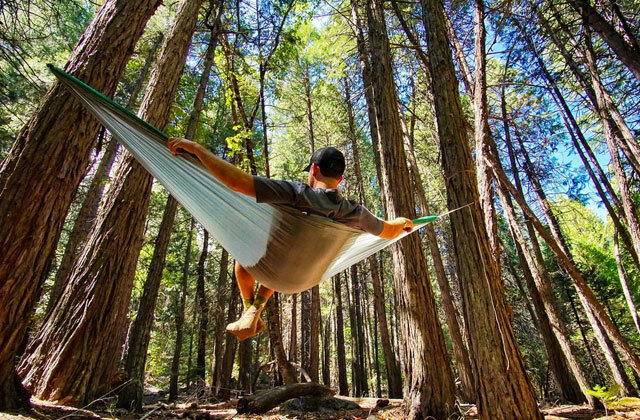 That said, if you are interested in more sophisticated camping equipment, you could also check out our reviews of camping stoves and hiking backpacks that will smoothen your hiking experience.